Whether you manage a huge brand or own a small business, it’s mandatory to maintain an online presence, especially on social media platforms. However, nowadays, the latter is in a bigger need of social signals, because, after all, we’re talking about a small business which is still unknown and needs all the promotion it can get. Let’s take a few minutes and go through all the advantages a small company can have after some proper social media exposure, shall we? First thing first, one of the main purposes of social media is to boost your business’ visibility among current customers and potential customers. Besides this, it creates a direct way to share your brand’s voice and content with all these people interested in the product or service you’re offering. We’ve reached a point in which customers expect a company – whether it’s a small business or a bigger one – to be easily accessible and recognizable online. Basically, when they search for a business and don’t manage to find the information they need, they will automatically assume that it doesn’t exist and move on. 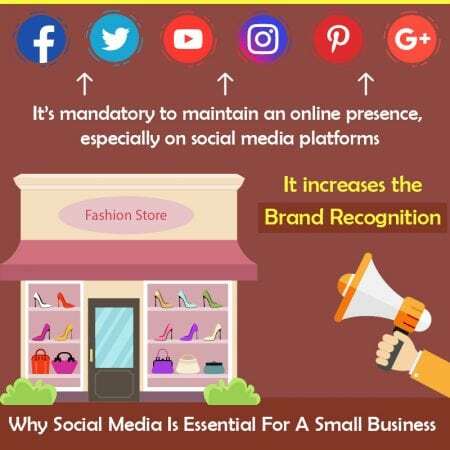 Considering this, we can say that increasing the brand recognition through social media can help you generate a lot of prospects and eventually convert them into customers. Let’s face it, traditional marketing methods, like print or digital ads, postcard mailers and so on are ridiculously expensive. And not always very efficient! Sure, they are important, but in most cases, a small business owner can’t afford to pay for them. But hey, social media is always there to help! Just imagine the following situations: a satisfied customer posts on their Facebook profile about how great your service is. This is more powerful than placing an ad, since it’s a genuine review, in which somebody who used what you’re offering says how happy he or she is. And guess what? It didn’t cost anything, which is excellent for a small company with a reduced budget. Nowadays, if you have a problem with a product or a service, most of us go directly on social media in order to look for some assistance, ask questions or even provide some feedback. Usually, there’s a social media manager or a member of the customer support team, if it exists, always ready to solve any problem. After all, this is why Facebook introduced the ratings in the first place! Whenever a customer writes on your page about a positive experience with your small company, you can easily share this as a testimonial, so all your followers can see it! Google will also give some love to your company if it’s present on social media and this is an aspect some people tend to ignore. For a few years, the search engine considers social media signals as a factor in determining whether a business will rank well in SERPs. When creating your social media posts, think about ways of helping your followers spread your message and make sure you create as much engagement as possible. Pro tip: show your customers that you care about them and offer some incentives from time to time. If all these sound great but you just don’t have the time to make sure that your small business is present on social media, you can let IB Systems do it for you. With almost 10 years of experience in helping local companies in Tampa Bay to expand their web presence, they surely know how to make sure your social media game is on point. Previous PostPrevious Notes/Domino is finally official, preparing us for the second beta of version 10!